This Womens asymmetrical top has a long cut with a hemline that is longer on both sides and shorter in the front and back. It has close-fitting, three quarter length sleeves. It is presented in two color choices that appear in wide horizontal bands. 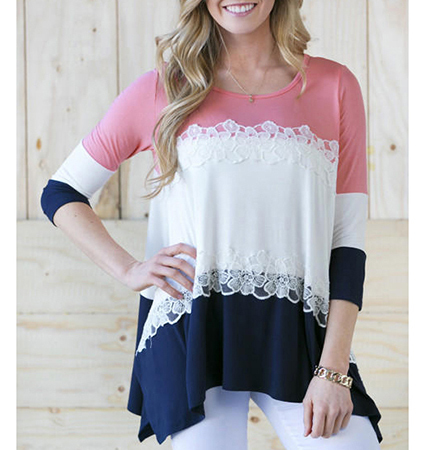 Select your favorite from pink, white and navy or aqua, white and navy. White lace trim appears between the bands of color. This is a machine washable garment that can also be tumbled dry. It is available for purchase in sizes Large, Extra Large and XXL.